He was born in a family of intellectuals in Khalisa village of Vedibasar province of Western Azerbaijan on the September the 30th, 1969. Then his family moved to Baku. In 1978, he finished school #158 in Baku and then went to military service. After being demobilized from the army, he entered the faculty of Sports and Military Training at Baku State Pedagogical University. He was appointed for 3 years in Lankaran city. Later on, he returned to Baku and started working as a teacher of basic military training at school # 153. He was very much troubled after the events of January the 20th, 1990. The massacre in the areas such as Dashalti, Malibeyli and Kerkijahan forced him to join the army. Thus, he applied to Yasamal district Military Commissariat where he was appointed as a commander of a newly established 5thbattalion of Yasamal. Along with his battalion he fought bravely in the battles for the villages such as Alkhanli, Kurdmahmudlu, and Lower Seyid Ahmedli in Fizuli region. The 5th of March 1994 … Miralekbar’s last battle … Our great soldiers decided to take a rest after releasing Gorgan village from Armenian occupation. At this time scouts came with disturbing news about Armenian invasion of two other villages. The brave commander took up the arms with his fellow battle friends. After a very heavy battle the two villages were taken back but the enemy bullet ended his life. He closed his eyes forever in the battle field of Fizuli region. 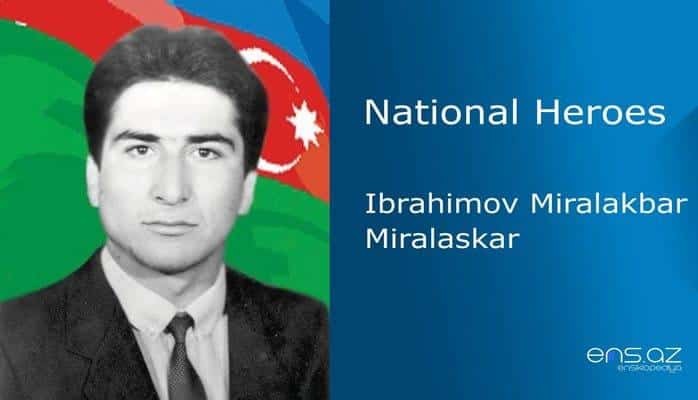 Miralekber Ibrahimov was posthumously awarded the title “National Hero of Azerbaijan’ by the decree # 203 of the president of republic of Azerbaijan on the 16th of September, 1994. School #153 where he once taught is now named after the hero.